Recently, my daughter, Mira, and I attended the opening of The Language of Art, my first group show at Edgewater Gallery in Middlebury, VT. The opening was fantastic. 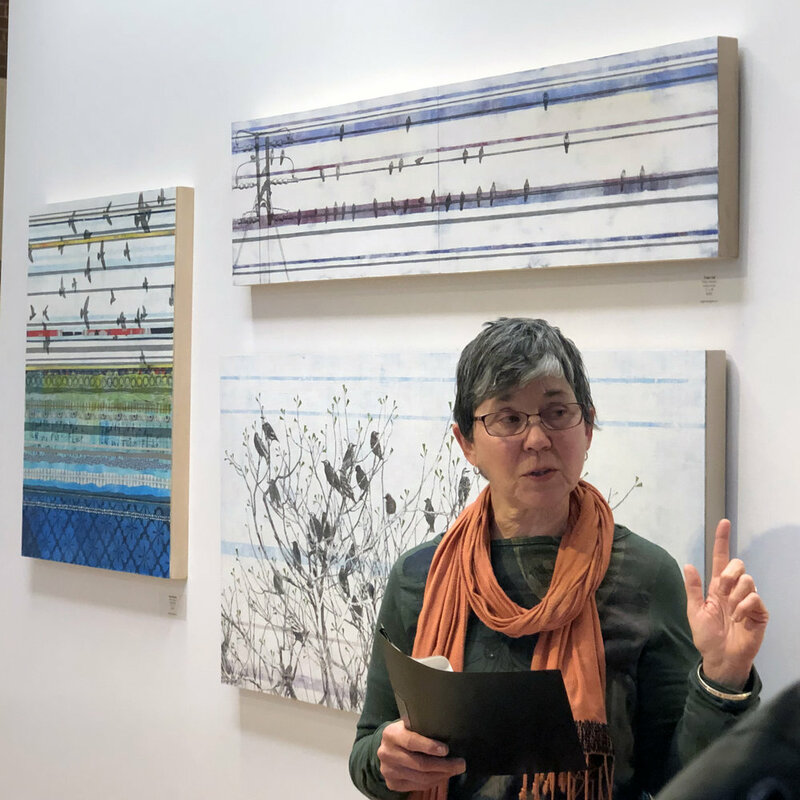 The gallery collaborated with a local group of writers, the Spring Street Poets, by having this talented group create original work in response to different paintings in the show. The other artists in the show are: Holly Friesen, Robert O’Brien, Victoria Blewer, Margaret Gerding, and Liz Hoag. I’ve included images and text of the poets who wrote about my work here. It was quite a moving experience to hear the poets’ thoughtful responses to the different paintings. Mary Pratt reads Birds on Wires, her lovely riff on my painting Treble Clef (on the wall behind her). 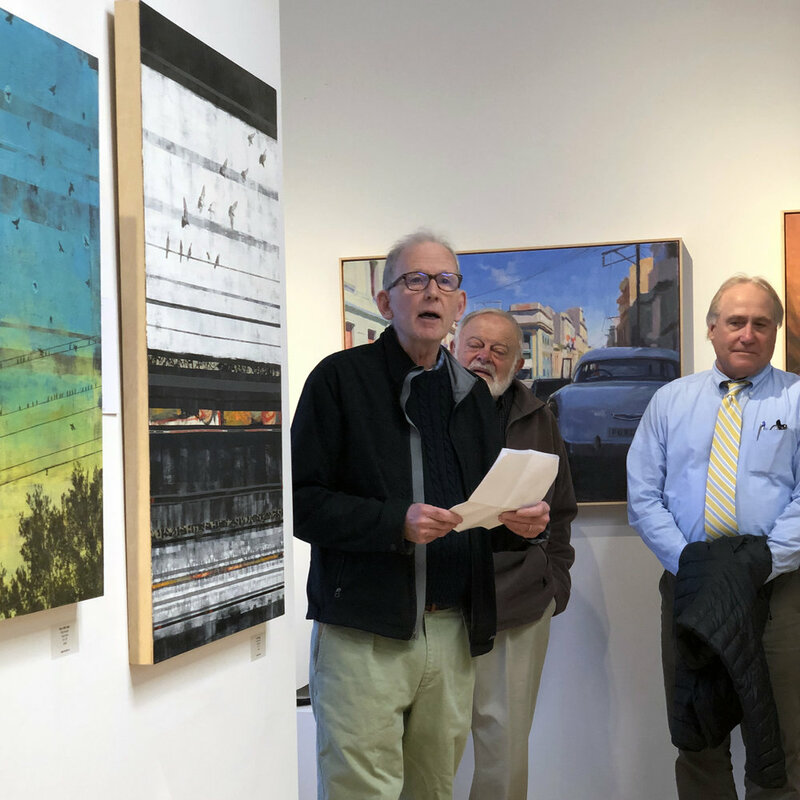 Ray Hudson reads View from a Bus, a poem about moving on, inspired by my painting Soft Landing (on the wall beside him). .
solicitations. Soft landings are still landings. Kari Hansen reads Stay a Little Longer next to my painting with the same title. I love how her poem really inhabits the painting. I am a fiend of wanting. This moment, this should stay. Be willing to alter my perceptions.